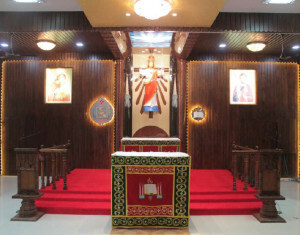 Prior to the formation of Kalyan Diocese, the spiritual needs of the Keralite Catholics of Marol were looked after by the Parish Priests of St. John, the Evangelist Church, Marol. Besides St. John Church, the faithful are indebted to the Trustees of the Marthoma Care Centre too for their services. Right from the year 1964, due to the imitative of the Kerala Catholic Association, the faithful had the opportunity to attend Malayalam Mass once a month. KCA was also in the forefront to get priest from Kerala to meet all the spiritual needs of the faithful in those days. Immediately after the formation of the Diocese of Kalyan, Rev. Fr. Harry Alapatt a CMI Priest was assigned to Andheri (E) as the first Parish Priest. Fr. Harry convened the 1st General Body Meeting and elected the first and second trustees as Mr. Anthony Murinjatheri and Mr. P. J. Ephrem. Rev. Fr. Davis Pulikottil took charge in 1989. As we had no church or place of our own in its initial stages, all the services were carried out at St. John Church. During Fr. Davis’ tenure, Malayalam services were conducted on every Sunday. MCBS Fathers took charge in April 1992. Rev. Fr. Eprem Pottemplackal was the pioneer among them. He introduced the Family Units, Youth wing, Catechism classes, Altar boys and the Church choir. Parish Day was celebrated for the first time on 18th April 1993. Fr. George and Fr. Dominic shouldered the biggest task of securing a place of worship of ourown. 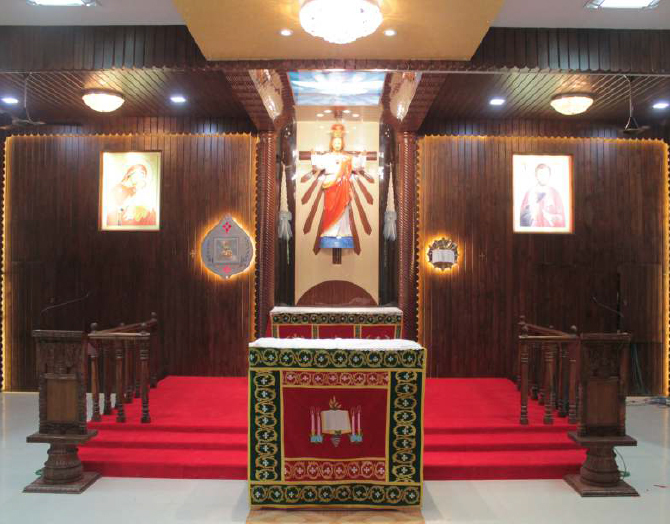 A common prayer centre for the faithful of Andheri (E) became a reality in October, 1995. His Excellency Cardinal Simon Pimenta inaugurated the prayer centre and named it as ‘Kristuraj Centre’. Since then the services on weekdays were carried out at the centre. Later, the celebration of the feast of St. Sebastian and Kristuraj began in 1996 and 1999 respectively. We refunded the shares of Sahar and Chakala Parishioners and occupied the ‘Kristuraj Centre’ in 1998. From November, 2000 the Sunday Qurbana also began at Kristuraj Centre. Rev. Fr. Mathew, Fr. Pious, Fr. Jerry and Fr. Jis were the priests who served us in the following years. With the effort of Rev. Fr. Pious and the Fund raising Committee and with the generous help of the diocese, we could occupy the hall above the Church in August, 2006. Bishop Mar Thomas Elavanal blessed it on 24th Dec. 2006. In April 2009,during the tenure of Rev. Fr. Jerry Vallomkunnel, Kristuraj Church attained the status of a Parish. We have Rev. Fr. Jebin Pathiparambil as the present Parish Priest. He arranged the celebration of ‘Raza’ Qurbana in our Church on July 3rd 2012, by Mar Thomas Elavanal. Though there was an intention of repairing the first floor, the rain caused for the repair of the whole church. Hence the church was reconstructed and consecrated by Mar Thomas Elavanal on 13th October, 2013. Parish Priests who served us are: Fr. Harry Alapatt CMI, Fr. Davis Pulikottil, Fr. Eprem Pottemplackal, Fr. George Kunnath, Fr. Dominic Mundatt, Fr. Mathew Panackachira, Fr. Pious Oroplackal, , Fr. Jerry Vallomkunnel and Fr. Jis Mangaly. At present Rev. Fr. Rinto (Abraham) Kootakara MCBS is the parish priest. Area of the Church Property : Ground 2245 Sq. ft + Mezzanine Floor of the same area.